A major stretch of NB I-75 in Oakland County has re-opened after being completely closed Monday for emergency repairs. 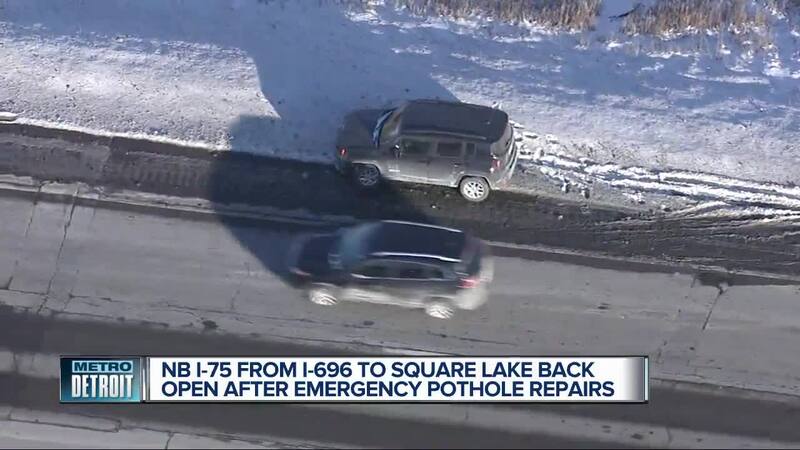 (WXYZ) — Road crews have reopened lanes on northbound I-75 from I-696 to Square Lake Road after closing all lanes Monday afternoon due to emergency pothole repairs. MDOT confirmed in a tweet the reopening of the lanes adding that crews will return Tuesday morning to block off one lane for more patching. The closure initially extended from I-696 to M-59. NB 75 REOPENED from 696 to Sq Lake. Crews will return in am to block a lane for more patching due to freeze/thaw. SB 75 from Sq Lk to 696 has only 1 lane open for couple more hours. According to Diane Cross of MDOT, nearly 20 vehicles were affected by the poor road conditions. Heads up-NB 75 is CLOSING from 696 to M 59 for emergency road repairs. Unknown ETA to reopen. HEADS UP-NB 75 near Crooks has only one lane open! Multiple potholes from 12 Mile to Crooks. County crews will be out shortly to make repairs. Avoid area! The closure stayed in effect for "several hours." County crews were in the area making repairs, according to MDOT, so motorists were asked to avoid the area completely. According to Troy police, several cars have been disabled due to the road conditions. Police say MDOT closed northbound I-75 at I-696, where patch work was done but is now falling apart. Drivers were also not able to enter at northbound I-75 from 14 Mile Road, Rochester, Big Beaver or Crooks. According to Diane Cross, a spokeswoman for MDOT, the emergency repairs are due to the crumbling roads. "The road is in dire need of replacement. It is crumbling," she said. Cross adds that repairs were done last year, but because of the freeze/thaw Michigan had this past weekend and today, the roads were unable to stand the changes in temperature. And when people drive at a high rate of speed on the roads, it causes potholes.